The pictures of Ryan by himself are the final step of removing chocolate and dog slobber from Ryan. The ones of Ryan and Mom are on Saturday morning before Joy's party. Ryan loves to put bubbles in the tub, now that we have the new tub, he puts in 1 drop and turns on the jets and they just fill up the tub! Ryan is finally feeling a little better. His temp is around 99 instead of 103. He is still congested and coughing but he the fever was what was really making him feel so bad. 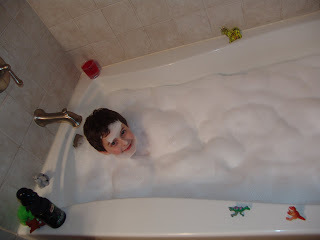 Off to give him an other bath, he says it helps, I think he just likes having an excuse for bubble baths. Baths do make you feel better when your sick......the warm water is the best! Our new house has a tub with jets.....I can't wait to take my first bubble bath! oh those are cute. Crystal, mom looks great I think. I didn't say she looked bad, she always looks beautiful! What about neices, can we check your blog??? that is a huge amount of bubbles. Your mom is very brave to let you take a picture of her in the tub! I love the look on Ryan's face in the first picture.